We publish an annual newsletter, Forum Focus. This contains information about our programs, articles and reflections on intercultural ministry, book reviews, updates on Forum staff and board members, and other articles related to our work. To subscribe to Forum Focus please contact us by telephone or e-mail. The current and previous issues of Forum Focus can be downloaded in Adobe Reader* (PDF) format. 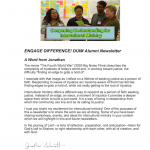 Every month we produce a email newsletter for alumni of the DUIM program that includes reflections from the Director, Jonathan Schmidt, and past participants, as well as news about the Forum and upcoming programs, and other interesting tidbits. Contact us to sign up. 4. Help support the Canadian Churches Forum and intercultural ministry programs! Short Term Mission: Meaningful Travel or Christian Tourism? * If you do not have Adobe Reader installed on your computer, you can download it free from Adobe’s web site.